Computational Medicine Night is the Institute for Computational Medicine’s annual networking event geared towards undergraduates who are interested in learning about the academic discipline of Computational Medicine and the research conducted in ICM labs. 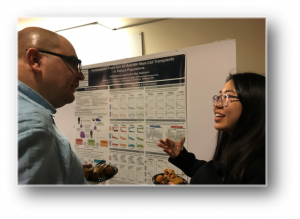 Held each spring term, Computational Medicine Night showcases undergraduate research and provides a forum for interested students to meet and mingle with ICM faculty, students, and postdoctoral fellows, to gather information about the Computational Medicine Minor, and to ask questions. HiPSCs are generated from somatic cells and can be differentiated into various kinds of human tissue. HiPSCs are commonly used in drug testing and modeling genetic diseases of organs. Due to their ability to differentiate into many kinds of tissue, patient specific hiPSCs have great potential in treating diseased organs by regenerating healthy tissue. Currently, hiPSC CMs cannot be fully differentiated. Thus, these immature hiPSC CMs have different electrophysiological properties than native CMs. Previous attempts to treat cardiac diseases by injecting hiPSC CMs often result in arrhythmia. The arrhythmogenic mechanisms remain unclear. The goal of this study was to simulate intramyocardial injection of hiPSC CMs into a heart after myocardial infarction heart failure and reveal conditions that can lead to arrhythmia. 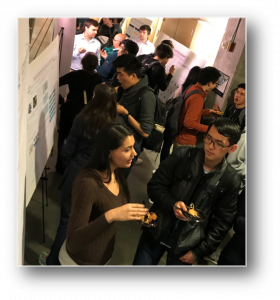 Explore ICM labs, mingle with faculty, students and postdoctoral fellows, view posters, and enjoy dinner while you’re at it!